Rose white(15 pt. 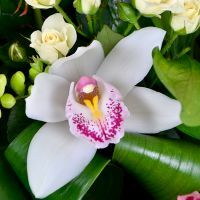 ), Orchid white(4 pt. ), Eustoma pink(7 pt. ), Rose shrub white (10 pt. ), Basket(1 pt. ), Greens(1 pt. ), Oasis(4 pt. ), Freesia white(5 pt.). 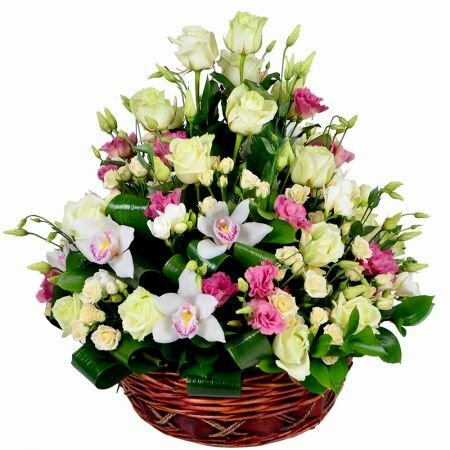 Birthday, Daughter, For grandmother, For her, For mother, For young lady, Girlfriend, Gratitude, Mother-in-law, Recover, Sister, Wedding Day, With love, Аnniversary. 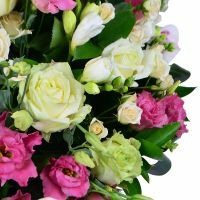 White orchids surrounded by white roses, freesias and pink eustoma - are ingredients of the incredibly delicate bouquet «Pretty basket». 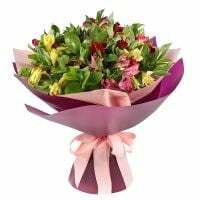 Flowers delicately assembled into a coherent and harmonious composition, which seemed out of the dream. 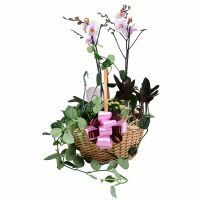 Saturated and bright green merely adds the charm to delicate buds while nice basket makes the arrangement incredibly stylish. Bouquet «Pretty basket» represents the feminine sensuality and fragility. 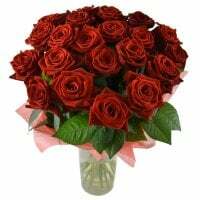 That is why it can become an irreplaceable gift for the anniversary of a relationship or wedding, the birthday of the beloved woman or dear mother. There can be dozens of reasons to present such beauty. 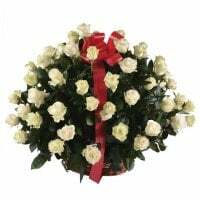 The main thing is to remember the basic recipe of the perfect present: a marvellous original bouquet, cordial wishes as well as a sincere smile. And you're guaranteed to get lots of gratitudes and shining eyes of the dearest one. 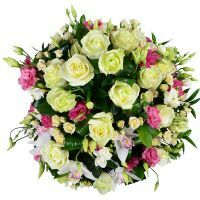 Attention: the bouquet may differ from the image presented on the website.